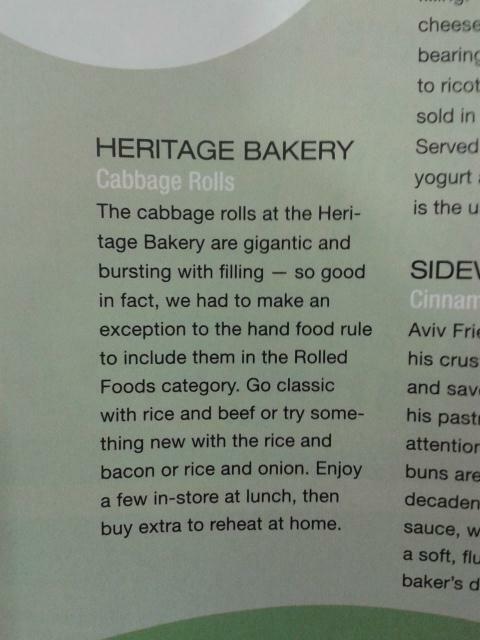 "Kathy Batorowska from Heritage Bakery and Deli is in with cabbage roll and perogy making tips. The hosts will square off in friendly competition while we talk traditions and traditional foods." "Our pirogies are made from scratch, by hand, all on site. We make 10 different kinds. A variety of kinds for everyone's different taste. They are handmade from scratch; they are filling, they are wonderful, they are warm, they are very popular. They are the best pirogies in Calgary. What else is there to say? They are delicious." "The cabbage rolls at the Heritage Bakery are gigantic and bursting with filling..."
"Created on-site, hand-made, delicious food...and you just know that they're made with love." Mp3 audio file will play in a new window. ...are bulging with either plums or blueberries"
you will share with your friends and soon become one of ours." Courtesy Victoria Baitson, Great News Publishing Ltd.
"Once you step inside Heritage Bakery & Deli, you'll immediately feel at home." 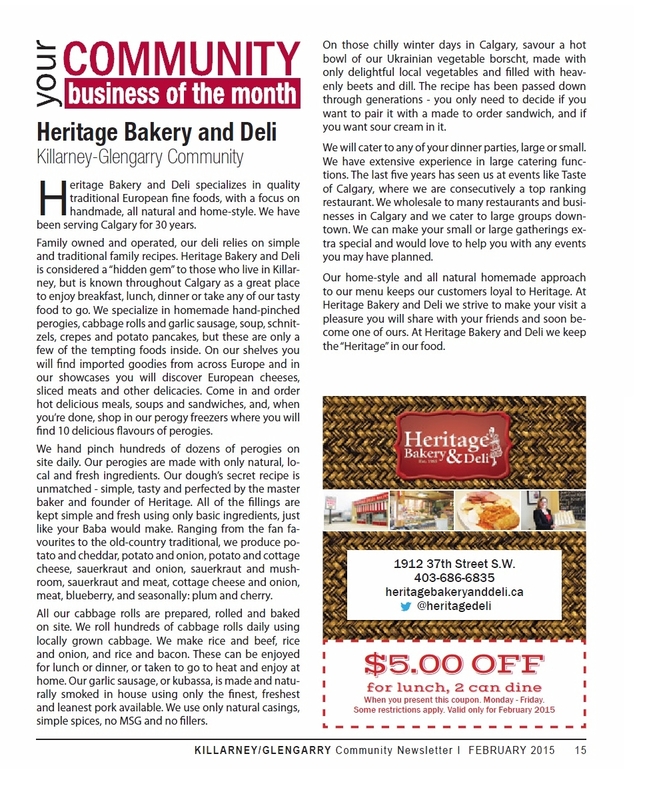 "Heritage Deli & Bakery is another example of the diversity of shops in the Killarney area. 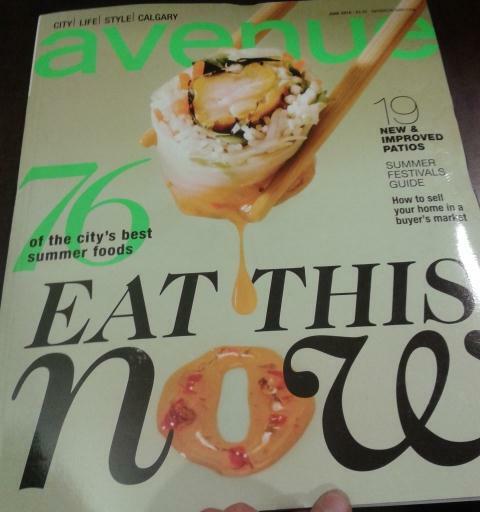 All good urban villages have a signature deli and bakery." their meat crepes or potato pancakes and their schnitzels! " - a process that sometimes takes them all day to finish." assuming control of Heritage Bakery and Deli and its legion of loyal customers. work faster in tracking down some appropriate perogies. I went to Heritage Bakery and Deli last Friday morning and bought some sausage to take to my parents' house for Christmas Eve. My father is Ukrainian (his father came from Ukraine) and my mom makes a lot of the food. Before moving to High River, my parents lived in a small Ukrainian village in Manitoba. They always bought their sausage from the local grocery store which had (and still has) the reputation of having the best sausage around. When I would go home to visit my parents, or when they would come visit me, we were always getting sausage to take to Calgary. Since my parents moved to High River 3 years ago, my sausage connection was gone and I've been trying to find good sausage here in Calgary ever since. My search is over. Walking into that deli was like walking into my Baba's kitchen back in Manitoba. The sausage was still hot when they packaged it up for me. Of course, I had to try it as soon as I got home. It was, by far, the best sausage I ever had. I did not mention any of this to my parents, as I wanted to get their honest opinion. Well, they tried it and could not get enough of it. They both said it was even better then the sausage they used to buy in Manitoba. That's quite a compliment coming from my family! I am already planning my next purchase for Ukrainian Christmas.